From the Atlantic Ocean shoreline to the Mississippi River, the pioneers cleared forest for farms and settlements. 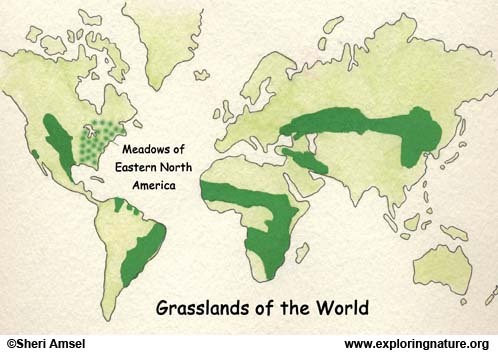 Some land has grown back to forest, and some has been kept open for farms. Most has been developed into towns and cities. Fields of tall grass and wildflowers, whether left wild or cut late in the season for hay, are an example of a real habitat. Plants are food for insects, which in turn pollinate the plants and lay their eggs among their leaves. The eggs hatch thousands of offspring and the insects are eaten by birds, reptiles, small mammals, and even other insects. Insects are prey to so many animals that they have come up with special ways (adaptations) to survive. Late in the summer you can see the tall yellow heads of golden rods. They are used by gall flies, wasps and midges that lay their eggs in the stem of the plant. The hatching young insect (larva) causes the plant tissue to grow into a swell around the insect, forming a gall. The gall is a safe place for small insects to grow and form. Here it is safe from predators, cold and wet weather. Monarch butterfly caterpillars feed on milkweed plants. The milky sap of milkweed is poisonous, but not to the monarch. The poison is passed on to the monarch caterpillar and the adult butterfly. Predators learn not to eat monarchs and their caterpillars because of their toxic taste. Even butterflies that look like monarchs, like the viceroy butterfly, benefit from the monarch's bad taste. The spittle bug lays her eggs on the stem of a meadow plant and covers them with a frothy mass that looks like spit. This protects them from predators, parasites and the hot sun. Though insects are often thought of as pests, there are many that benefit people. Bees and butterflies are plant pollinators, helping our crops and fruit trees. Some insects eat other pest insects, like the ladybug eating aphids. Then there are spiders, not insects themselves, but a well-known insect eater. Less common insects like the praying mantis can help man by eating grasshoppers and other problem insects. Even the pest insects themselves have a role in their habitat. They are at the bottom of the food chain and are food for many other animals. Other animals found in meadows are; shrews, voles, mice, red fox, white-tailed deer , garter snakes, and many birds like; marsh hawks, redtailed hawk, woodcock, snipe, goldfinch, meadowlarks and many others. 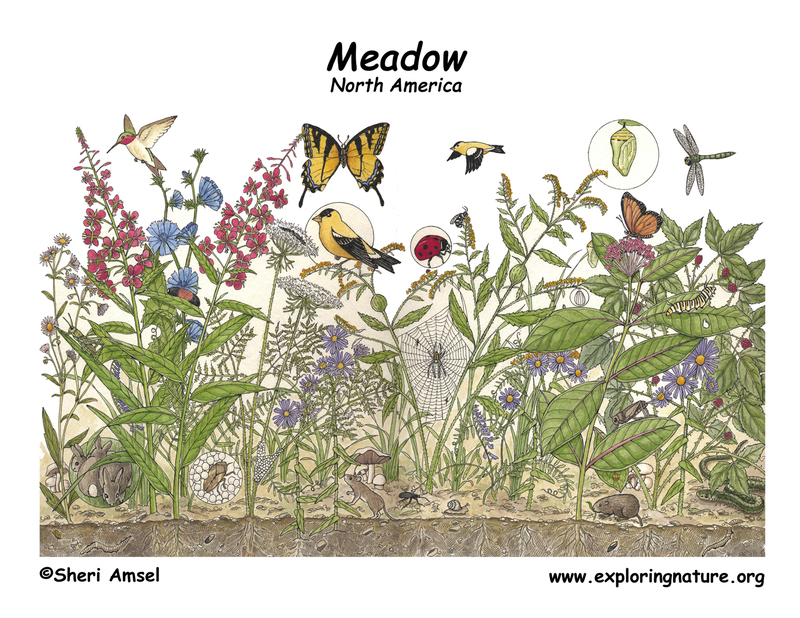 Meadows are not just grass. They are often full of wildflowers. 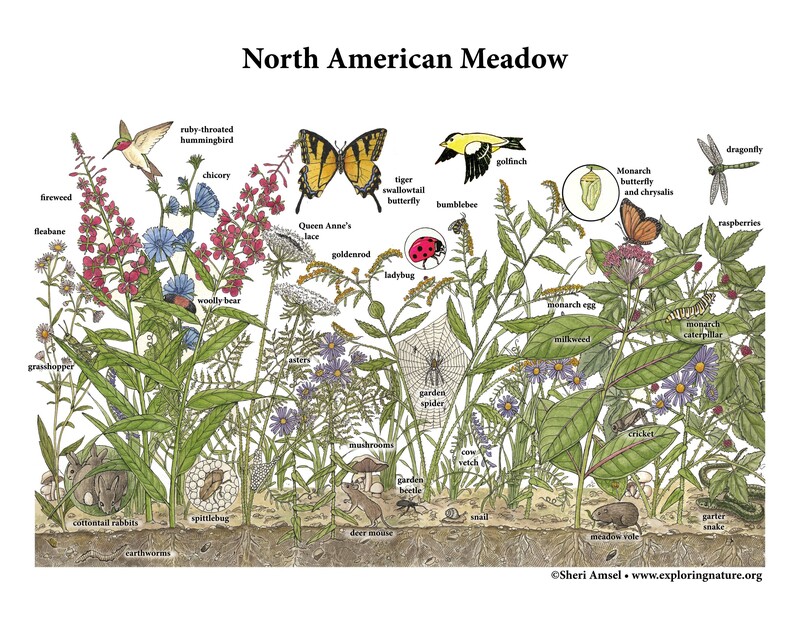 Some plants you might see in a meadow include; milkweed, cow vetch, goldenrod, daisies, asters, fleabane, black-eyed Susan, Queen Anne's lace, clover, fireweed, meadow rue, mullein, burdock, thistles, chicory and many more.